to Learning Wing Chun Faster? I ran across some pretty awesome research I want to share with you. And I think you'll like it if want to improve your skill quickly and with less stress. According to science, the solution could be as simple as training outdoors surrounded by lush green nature. Biology instructor Jacob Bear wrote, "…research found that people who live near forested areas have lower levels of cortisol, a harmful stress hormone. People with attention deficit disorders demonstrate improved concentration after spending time around trees." This is great news because I love training outside. This kind of research was taken to the next level. An article from the British Journal of Sports Medicine describes how a group of scientists from Heriot-Watt University in Edinburgh hooked up young adults with portable electroencephalography (EEG) recorders. These are the machines where they stick electric probes onto your head and measure your brain waves. This set up allowed the researchers to measure outdoor brain activity in real time. The subjects were asked to walk in a park, a quiet suburban neighborhood, and a busy downtown. As you may have guessed, the subjects walking through the park reached a peaceful mental state. Psychologists call this state "effortless attention." The EEG recorders measured, in real time, evidence of "lower frustration, engagement and arousal, and higher meditation when moving into the green space zone; and higher engagement [higher stress] when moving out of it." A mind in a state of "effortless attention" is able to process a lot of information without fatigue. 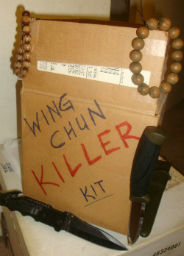 This is an optimal state for studying and training Wing Chun, and virtually anything else. It's a great way to leverage your training time as more of it absorbs into your mind and body (muscle memory), with less stress. And the more often you do this, the easier it will be to reach "effortless attention" when you want to. So, train outdoors, take a hike, go camping, jog through a park, and get in a few Wing Chun forms. Or meet up with your training partners in some green space and take your training to the next level.